A deep strain of tribal politics is dividing societies around the globe. Organized religions are also coping with scandals, disappointments, and polarizing ideologies. The history of Christianity reveals that such frictions deeply wound the church. Fr. Richard S. Vosko recognizes that liturgical buildings are metaphorical expressions of the people of God. He proposes, in a relational way, that when all physical and psychological boundaries in a place of worship are removed people will discover a common ground. Building on theological foundations and design principles, Vosko envisions what an egalitarian "servant church" can look like. In a bold but thoughtful manner, he presents progressive insights into the fields of church art and architecture. Richard S. Vosko, PhD, is a priest of the Roman Catholic Diocese of Albany and has worked internationally as a liturgical designer and consultant since 1970. His award-winning portfolio includes 135 churches, 13 cathedrals, and innumerable synagogue consultations. Vosko is an honorary member of the American Institute of Architects and is a well-known author and lecturer on religion, art, and architecture. "The wound of division is the starting point that this thought-provoking and prophetic plea for egalitarian places of worship&#39; and social justice&#151;although without exploring a <I>dynamic</I> use of the traditional distinction between nave and sanctuary&#151;gently turns towards the core of a common ground: the healing, reconciling wound of the paschal mystery that transforms worshipers into the Body of Christ and the places they shape intoministers of hospitality and hope' in this world." "A compendium of Richard Vosko's life-giving liturgical knowledge. He has a rare gift for presenting divisive issues in clear-cut language, riding the pendulum of conflicts between Vatican II Reformers and the Reformers of the Reform. While he explores the significance of architecture as metaphor, central to his thinking is the challenge of building a building to worship a God who is simultaneously transcendent and immanent. Vosko is on fire with the link between social justice and community worship. If you think you know church architecture, read this book. If you are planning to build or modify a church, first read this book. If you are student of liturgy or architecture, absorb this book." 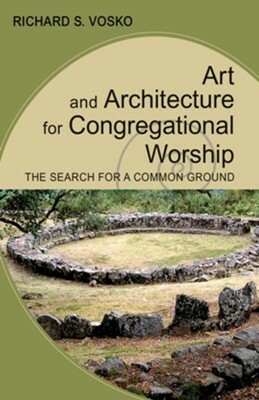 I'm the author/artist and I want to review Art and Architecture for Congregational Worship: The Search for a Common Ground.